Crash Test Dummies are an alternative rock band which formed in Winnipeg, Manitoba, Canada in 1989. They are best known for their 1993 international pop hit "Mmm Mmm Mmm Mmm". Up to 1999 the band has consisted of Brad Roberts (vocals, guitar), Ellen Reid (keyboards, vocals), Benjamin Darvill (guitar, mandolin), Dan Roberts (bass) and Mitch Dorge (drums). 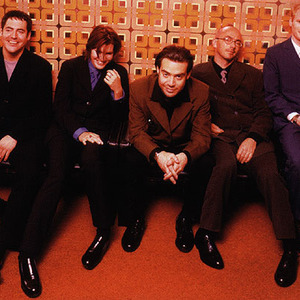 Nowadays Crash Test Dummies has essentialy become a solo project for Brad Roberts, albeit Ellen Reid, Dan Roberts and Mitch Dorge sometimes join him both on record and on stage. Formed in 1989 in Winnipeg, Manitoba, the group quickly signed to a major label and released their debut album, The Ghosts that Haunt Me, on April 5, 1991. An unusual combination of folk-rock stylings with witty and offbeat lyrics and the attention-grabbing voice of vocalist Brad Roberts, the album became one of the year's best-selling records in Canada on the strength of the hit single "Superman's Song". It has sold nearly 500,000 copies in Canada, and won that year's Juno Award for Group of the Year. On October 15, 1993, they released the follow-up, the more polished and matured God Shuffled His Feet. It was also a success, with the first single, "Mmm Mmm Mmm Mmm", becoming a major pop hit internationally as well as in Canada and parodied by "Weird Al" Yankovic under the title "Headline News". The title track, "Afternoons and Coffeespoons", and "Swimming in Your Ocean" were also major hits on the Canadian pop charts, although they didn't follow suit outside of North America. The album would go on to sell nearly six million copies in America, and nearly ten million worldwide. On October 2, 1996, A Worm's Life, their most overtly hard guitar-rock album, proved to be the beginning of the end for the band's commercial fortunes, selling poorly compared to its two predecessors and only spawning the minor hits "He Liked to Feel It" (with a video featuring a young boy finding ways to pull out his baby teeth) and "My Own Sunrise". It ended up selling two or three million copies worldwide. Give Yourself a Hand, released on March 23, 1999, confirmed this decline -- although it included the Canadian radio hit "Keep a Lid on Things", the album's experiments in R&B and electronic dance music garnered the most negative reviews of the band's career, and sold poorly. The Crash Test Dummies moved into new territority releasing a mainly Country influenced album entitled I Don't Care That You Don't Mind which marked Brad Roberts return to form after a fairly serious car accident. Jingle All The Way followed which was a re-release of Christmas Carol renditions. In 2003 Puss 'N' Boots was released which harkened back to their original style, but arguably lacked the quirkiness and appeal of the early releases. The band's next release, Songs of the Unforgiven was a very sombre affair with dark lyrics heavily featuring death as the topic over a mostly simple acoustic backing track. In 2010, Brad Roberts released Oooh La La under his Crash Test Dummies sobriquet. Primarily a collaboration with engineer/producer Stewart Lerman, it finds Roberts changing up the band's sound again, often from one track to the next, while maintaining his trademark lyrical quirkiness. Following the release of this album, Brad Roberts and Ellen Reid toured in the summer/fall of 2010, playing a number of acoustic sets throughout the US. Many members of the Crash Test Dummies have continued to work in the music industry releasing solo material, possibly most noticeably Ben Darvill who as Son of Dave tours extensively supporting larger acts such as Supergrass in the UK. Brad Roberts has since released a solo "live" album, under the name Crash test Dude.